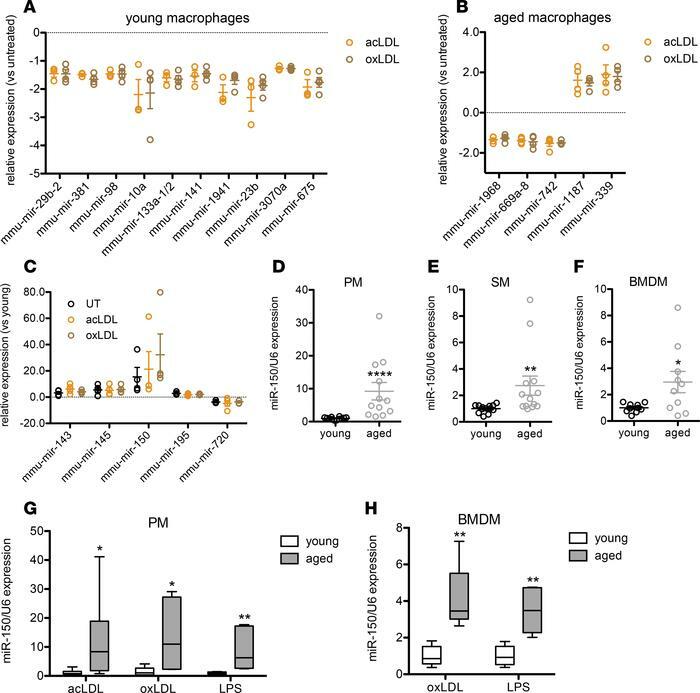 microRNA-150 is upregulated in aged macrophages of diverse origins. (A) In young macrophages, 10 microRNAs were downregulated similarly in response to acetylated low-density lipoprotein (acLDL) and oxidized low-density lipoprotein (oxLDL). (B) In aged macrophages, 5 microRNAs were dysregulated similarly in response to acLDL and oxLDL. (C) In untreated (UT), acLDL-treated, and oxLDL-treated macrophages, 5 microRNAs were dysregulated similarly in aged and young macrophages under the same treatment conditions. microRNA-150 was upregulated in aged peritoneal macrophages (PM) (D; n = 12/group; 2-tailed Mann-Whitney U test), aged splenic macrophages (SM) (E; n = 13/group; 2-tailed Mann-Whitney U test), and aged BM-derived macrophages (BMDM) (F; n = 10/group; 2-tailed, unpaired Welch’s t test). (G) Upregulation of microRNA-150 in aged PMs was not affected by treatment with acLDL (n = 7/group; 2-tailed Mann-Whitney U test), oxLDL (n = 7/group; 2-tailed, unpaired Welch’s t test), or LPS (n = 5/group; 2-tailed Mann-Whitney U test). (H) Upregulation of microRNA-150 in aged BMDMs was not affected by treatment with oxLDL (n = 5/group; 2-tailed Mann-Whitney U test) or LPS (n = 5/group; 2-tailed Mann-Whitney U test). Open circles depict individual data points; graphs depict mean ± SEM (A–F) (*P < 0.05; **P < 0.01; ****P < 0.0001).